Weekend Wrap: Chord Mojo case, TEAC USB DAC, Optoma headphones and more | What Hi-Fi? From the news that B&O and Ultimate Ears have added new Google technologies to some of their products, to Exposure adding DSD playback to its 2010S2 DAC and Optoma announcing a new range of hi-res in-ear headphones - it's What Hi-Fi? 's Weekend Wrap. 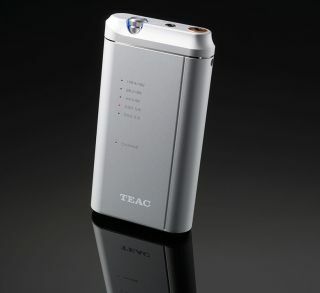 TEAC has released the HA-P5, a new USB DAC/headphone amplifier designed to be used with iOS and Android mobile devices. The internal circuitry is based on the company’s UD-501 DAC and HA-501 headphone amplifier. The HA-P5 supports playback of hi-res PCM files up to 24-bit/192kHz and DSD 5.6mHz. You can connect directly to Android and iOS devices via USB Type A and Type B inputs, but there's also optical and coaxial digital inputs, along with a line level analogue output for connecting to a home hi-fi system. LED lights on the front reflect the sampling rate of the content you’re listening to and the built-in rechargeable battery is said to be good for five hours of playback time. The HA-P5 will be available from late June for £499. Bang & Olufsen has added Google Cast wireless streaming capabilities to the BeoSound 35 all-in-one music system. The update means you can now stream music to the soundbar from a number of supported Google Cast apps, including Spotify and Google Play Music. Any music you do stream comes from the cloud, rather than from your mobile device, so in theory, sound quality should be better and incoming messages and calls won’t interrupt playback. Google Cast is also available on a few other B&O products including the A6 and A9 wireless speakers and the BeoSound Essence touch controlled music controller. Ultimate Ears has added Google Now voice integration, along with Siri, to its Boom 2 and Megaboom wireless speakers. The new voice integration means owners will be able to push the Bluetooth button on the speaker and ask it to play a song, artist or album. The voice control update is available now through the companion Ultimate Ears speaker app. Owners of the Award-winning Chord Mojo may be interested in a new case for their portable DAC. Chord has released a protective case for the device, which gives access to the power and volume buttons, as well as all connections. The case is made from a durable material with a real leather wrap and the Mojo sits snugly inside in a protective microfibre lining. The Mojo case is available now, priced £65. The earpieces are made from a “vibration-free” material and each pair has a different number of balanced armature drivers in each earpiece, depending on which model you choose. We’ve recently looked into the rise of hi-res headphones and whether they genuinely provide better sound quality. A certified logo doesn’t automatically mean better sound, and the proof is in the listening. Exposure has introduced an updated version of its 2010S2 DAC that can now handle single-rate DSD: DSD x64 or DSD 2.8mHz via the USB input, along with PCM support up to 24-bit/192kHz. The new 2010S2 DSD DAC is available now, priced £920. Current owners of the existing DAC can upgrade to the DSD version for £400. If you stream a lot of Ultra HD 4K content from Netflix or Amazon, you’ll know that a fast, stable internet connection is vital. If your home network is prone to interference and buffering, TP Link’s new Powerline AV1200 could be of interest. The Powerline technology uses your home’s electricity network to transmit data, which TP Link says helps to provide a more reliable connection. You get two plugs in a pack, one needs an ethernet cable from the router plugged into it to transmit data and the other can be plugged anywhere else around the home, as long as it’s on the same electric network. Run an ethernet cable from the second plug to whichever device you want to give a wired connection. The Powerline AV1200 is available to buy now from Amazon.